TF2 stops working after opening my map. Discussion in 'Mapping Questions & Discussion' started by RataDeOrdenador, Dec 12, 2015. I've been testing and adding stuff to my map. Ok. Everything went fine. Last time I tested it,it was working just as planned. I started adding some paths,fixing some textures,yadiyada. Now,whenever I open the game and try that map,well... I can select teams,character... But that's it. It stops working with the freaking sound looping again,and again and again. I don't have any leak and all those "fighting textures" are fixed,so I don't know what might be. ** Command: "C:\Program Files\Steam\SteamApps\common\Team Fortress 2\bin\vbsp.exe"
** Parameters: -game "C:\Program Files\Steam\SteamApps\common\Team Fortress 2\tf" "C:\Program Files\Steam\SteamApps\common\Team Fortress 2\sourcesdk_content\tf\mapsrc\PL_Canyonfield.vmf"
** Command: "C:\Program Files\Steam\SteamApps\common\Team Fortress 2\bin\vvis.exe"
** Parameters: -game "C:\Program Files\Steam\SteamApps\common\Team Fortress 2\tf" "C:\Program Files\Steam\SteamApps\common\Team Fortress 2\sourcesdk_content\tf\mapsrc\PL_Canyonfield"
** Command: "C:\Program Files\Steam\SteamApps\common\Team Fortress 2\bin\vrad.exe"
** Parameters: "C:\Program Files\Steam\SteamApps\common\Team Fortress 2\sourcesdk_content\tf\mapsrc\PL_Canyonfield.bsp" "C:\Program Files\Steam\SteamApps\common\Team Fortress 2\tf\maps\PL_Canyonfield.bsp"
I don't think it has to due with the map exactly, but it appears their is loading bug error. The usual causes of crashes like this are logic errors in your I/O and corrupt game files (usually caused by leaving Hammer open while TF2 updates). You could try hiding all game logic from your map except player spawns and seeing if you still crash - if you don't, then start checking all of your logic; if you do, validate your game. Thats just for our servers, and thats because our servers are special. And AGAIN,don't know why it started giving me this error,since I haven't touched ANYTHING from it and I've been having this configuration the whole time. damnyouhammer. I've been hiding all the logics until I found the team_train_watcher is the one giving me problems. It's the same one (with the same cart and the same other logics) from the GameTypeLibrary thingie. Obviously,edited so it matches the names and things I've been using. Welp,nevermind... 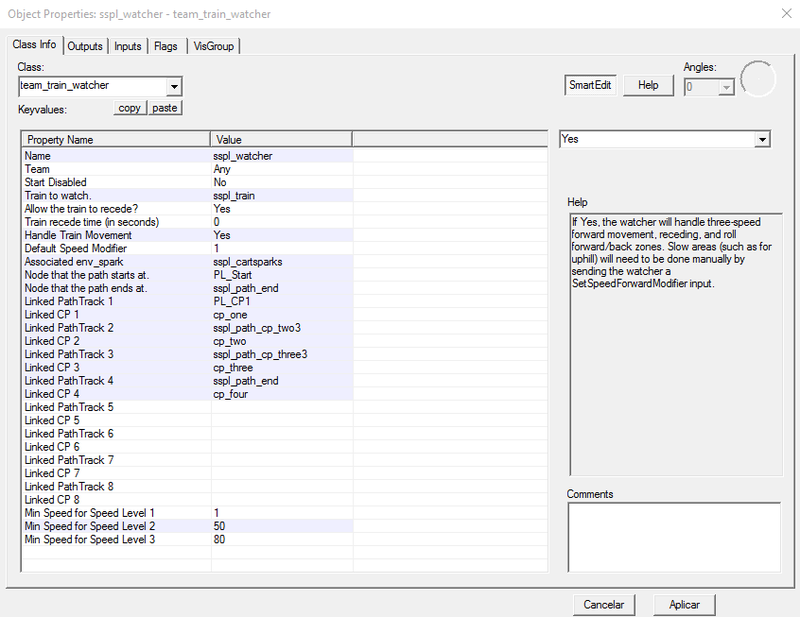 I just made another team_train_watcher and copied some of the settings I had. It works perfect now. Close this thread men. We're done here.